Physical activity is a key to lifelong health and is particularly important for full recovery from many injuries and illnesses. But after a life-altering sickness or accident, exercise can be extremely difficult. While it may be uncomfortable, medical challenges do not mean that activity is impossible. The key is finding the correct adaptive exercises to make sure that your body is safe during exertion. 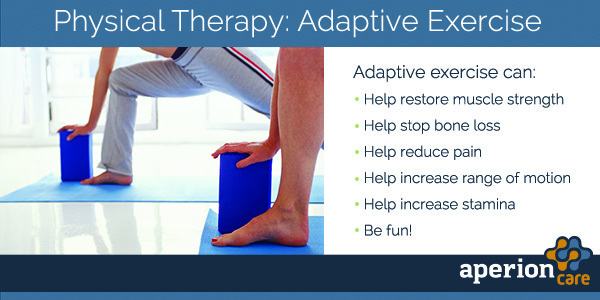 Trained physical therapists work to develop recovery plans for individuals learning how to navigate new limitations, including modifications to exercises that will help reduce discomfort and prevent further injury. Sometimes these methods will include special equipment designed or placed to reduce stress on certain areas of the body, decrease the intensity of a stretch, or assist with execution of the basic exercise movement. Adaptive exercise and adaptive equipment have a common goal: creating strength and confidence in recovery to restore independence.